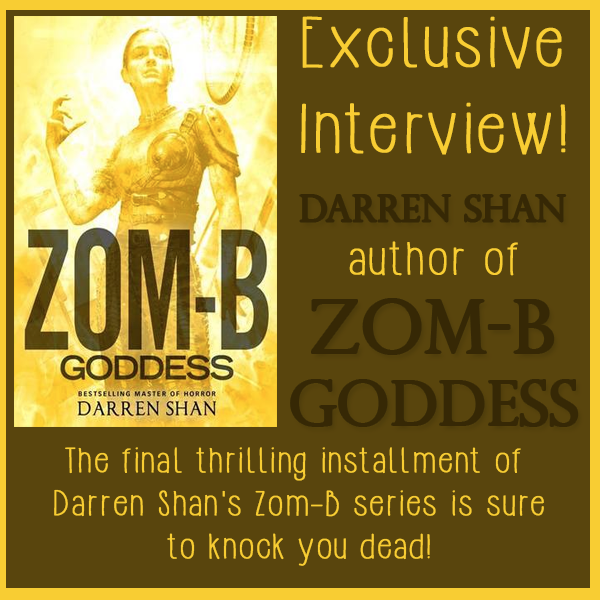 ZOM-B GODDESS is the final book in the Zom-B series, and we're thrilled to have Darren Shan here to tell us more about it. Darren, what scene was really hard for you to write and why, and is that the one of which you are most proud? Or is there another scene you particularly love? The ending was tricky for me, because it wasn’t the end I originally planned. When I started Zom-B, a lot of the overall plot was unclear, but I was sure of the ending – I even knew what the final line would be. But as I progressed through the novels, the main character, B Smith, evolved in ways I hadn’t anticipated, and I started to sense that my ending would no longer work. I wrote it as planned when I was writing the first draft of Zom-B Goddess, but when I returned to edit it, I had to change it. Luckily the plot presented me with a fitting alternative ending, so it wasn’t any great trouble to change it, but I’m pleased that I was able to make that call, and not stubbornly stick with the original ending, just because that was what I wanted to happen. When a book’s going well, it’s not always about doing what you want as a writer, but rather serving the needs of the story. How long did you work on ZOM-B GODDESS? I spent three years on it in total, though the series took about seven years to complete. I spent about three years on each book – the reason I was able to release them so quickly is that I juggle books around when I write. I’ll work on a first draft of book one, then write the first draft of book two, then do an edit book one, then an edit of book two, then write the first draft of book three, then go back and do another edit of the first book... and so on. It taught me that the story is always king. You can guide it to a certain extent as an author, but ultimately you have to let it lead you, rather than the other way round. What do you hope readers will take away from ZOM-B GODDESS? I really, really hope they enjoy the end. It’s hard, when you write a long series, to satisfy every reader, because they spend so long with the characters and plot lines. I think the ending will feel right for what’s gone before, and that’s ultimately the most a writer can hope for the finale of a long series. But time will tell! B Smith has escaped from the murderous clown Mr. Dowling, only to find herself trapped by someone she had once thought of as an ally. As B learns more about the twisted history of the zombie virus, she prepares to make a final stand against her enemies-even if it means making the ultimate sacrifice. 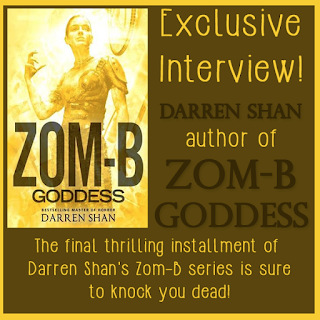 The final thrilling installment of Darren Shan's Zom-B series is sure to knock you dead! Darren Shan (born July 2, 1972 in London, England) is the pen name of the Irish author Darren O'Shaughnessy, as well as the name of the protagonist of his book series The Saga of Darren Shan, also known as The Cirque Du Freak Series in the United States. He is the author of The Demonata series, as well as some stand-alone books, and a series of books for adults under the alternative name of D.B. Shan. You can find out more about him at his website. 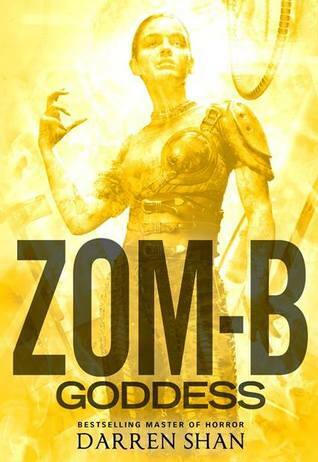 Have you had a chance to read ZOM-B GODDESS yet? Are you able to work on multiple novels in various states? Do you let the story lead you while writing? Share your thoughts about the interview in the comments! April 1st 5 Pages Workshop Opens in 1 Week!